The earliest sketches we have by Walter Haskell Hinton are of native people, made when he was a boy. Perhaps he drew them when he saw Buffalo Bill's Wild West show, which was operating in Chicago in 1893 during the World's Columbian Expo. 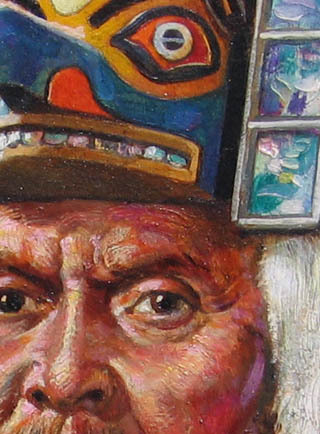 His respect for the traditional cultures of native peoples remained with him his entire life. Hinton's depictions of Native Americans can be divided into three general categories: ethnological, historical, and popular. Like most Caucasian artists of his generation, Hinton preferred not to depict the modern lives of or issues facing native peoples. Instead, he cherished and celebrated their heritage, taking pains in his 1948 ethnological studies to make sure that the costumes and activities he depicted were historically accurate. Given the limitations of research resources available to him (mainly books and magazines supplemented by his own collection of artifacts), this goal must have been very difficult to achieve. 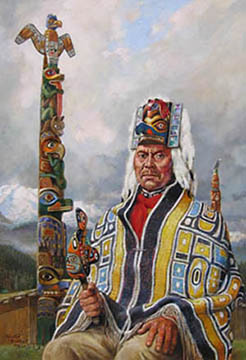 Tlingit, original painting for the Mammoth Western ethnological series. In his historical scenes, Hinton still preserves as much authentic detail as he can. But because these pictures are narratives of American history from a distinctly popular, mid- 20th-century, Anglo-American perspective, the relations between natives and Europeans are seen from a romanticized, European point of view. 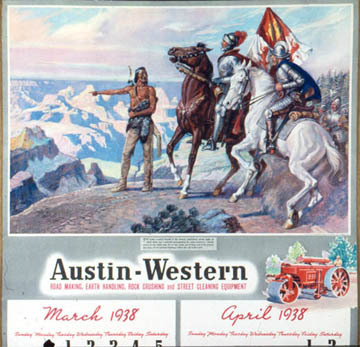 Thus, in a calendar image for Austin-Western, a native man obligingly guides conquistadors to the rim of the Grand Canyon, with no hint of the carnage that actually accompanied the colonization of America; while a white family's terror is emphasized in a depiction of the 1812 Massacre near Fort Dearborn (Chicago). The conflict did result in the deaths of women and children along with soldiers, but as a stand-alone image, it only tells one side of the story. 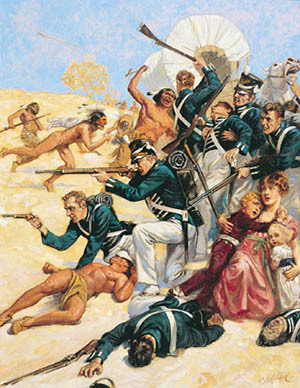 The plight of native families that caused the Indians to participate in the War of 1812 in this manner never appears in Hinton's work (or that of any other artist of the time). 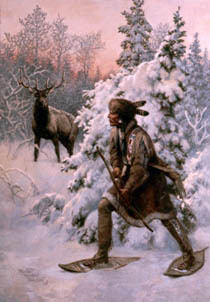 In his popular images, which were produced as art prints, puzzles, and calendars, Hinton catered to the large market for sentimental, romanticized pictures of Native Americans before the time of reservations. 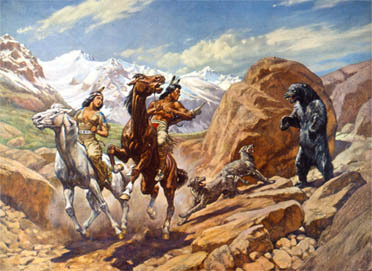 In one series, a native couple has repeated, dramatic encounters with bears. That Hinton was appealing to an audience that cared more for fun than accuracy is suggested by the woman's tight and low-cut bodice, which is in keeping with 1930s standards of glamour but is not accurate for traditional Native women’s clothing. 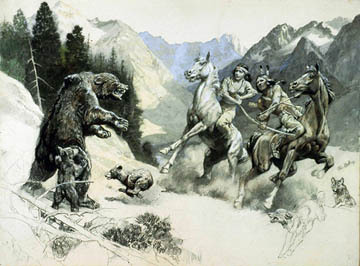 Although Hinton produced many of these popular scenes, he personally preferred the ethnological works. When he painted a set of 10 images for Mammoth Western depicting the major native tribes of North America, contrary to the normal contract terms he arranged to keep the original paintings – some of the only finished work made for magazines he ever kept. They hung in his house until the last years of his life. Beginning in the 1930s and continuing into the 1960s, Hinton painted a series of scenes in the life of General Washington. 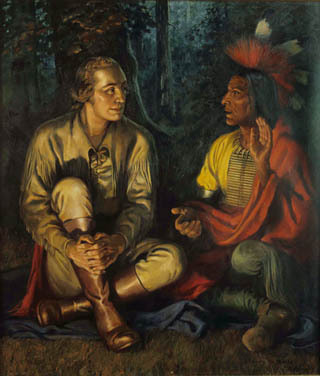 Two images in the series depict Washington meeting with a Native leader. Hinton’s client noted that Hinton depicted Washington and these leaders as equals: they share the foreground, leveling face to face with matched dignity, and in one Washington appears to humbly receive instruction from the Native chief. 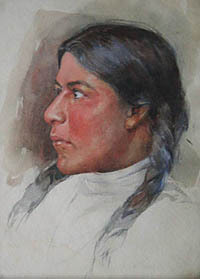 Watercolor portrait of unidentified sitter, made before 1920. Hinton kept very little of his own work, but this portrait was an exception. 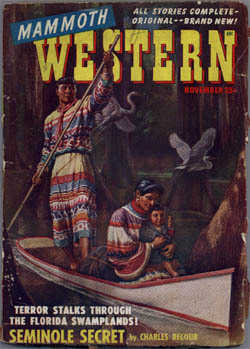 ethnological series, published in 1948. Hinton collected objects made by aboriginal people because he appreciated them artistically, as well as to use as references for his artwork. In his house he displayed them in careful arrangements, and educated visitors on their history and significance. 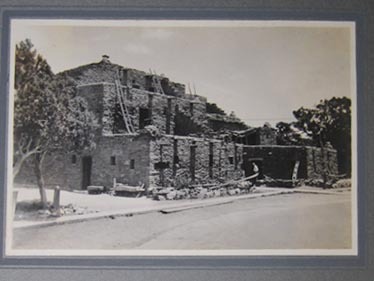 He purchased items when he was away on long trips, such as the one he made to Arizona and Utah at some time in the 1920s. 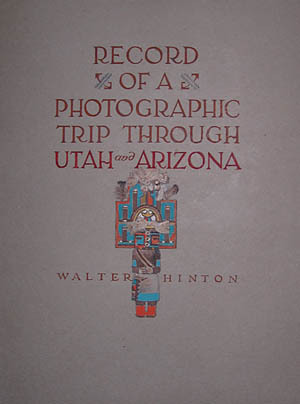 From that excursion he brought back a kachina doll, which he drew on the title page of his photo album documenting the trip. replica of an Indian community dwelling." Rough work for a print destined for calendars and puzzles. General Washington listens to a Native chief.